Cabin 4 is a genuine rustic antique log cabin with surprising comfort-touches. Complete with log bunkbeds, cute handmade quilts, refrigerator, coffee maker and full bathroom with hot shower. Separate bedroom and livnig area with small apartment size range. It’s a small piece of heaven on our 40 acre spacious ranch. 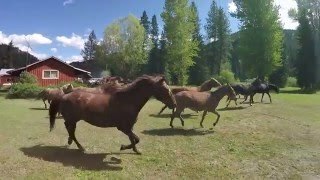 Watch our ranch horses play in the pond, roll around, run through the field, buck and jump, and having fun in the pasture. Nothing beats a trail ride in the Spring! The centrally located Lodge has dining, eating and gathering spaces (Full commercial kitchen). Bathroom and shower facilities are available. Stone fireplace, pool table, and sofas for relaxing and reading. Commercial kitchen is available for rent for large parties. Cabin 4 is part of our multi-lodging ranch. We have rustic cabins, lodge, camping and RV accommodations - even soft tent camping in the pines that sleep four persons each on twin log bunkbeds. These tents are nestled in the pines and feature wood floors, and cast iron wood burning stoves for your sleeping comfort. Our 40-acre ranch has one of the best and oldest neighbors in Montana: the Lolo National Forest (formed in 1906)! It encompasses two million acres for water sports and hiking. 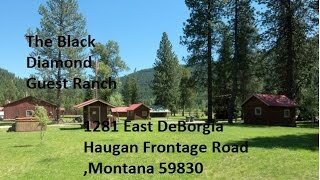 Year around fun starts from the Black Diamond Guest Ranch! Snowmobile Rentals; Horse back riding. Rattlesnake Wilderness backcountry (climb your way to high alpine lakes in the wilderness). We’d also recommend Welcome Creek Wilderness where the ridges are very steep and the valleys narrow - extremely rocky and rough. We are The “Best Kept Secret” in Montana for weddings, fund raisers, anniversaries, family reunions, scouting, church activities. We are tucked in the historic district of DeBorgia/Haugan. 3% credit card fee. Holidays are two night min. $25 non-refundable deposit for cabin reservation. 24 hour cancellation notice required. All reservations that exceed $1000, a 50% deposit is required and a 15 day written cancellation notice is required. $40/pp per hour horseback riding; 4 hrs $120 pp; 8 hrs $220; $120/person for 4 hours - $220/person for 8 hrs. Snowmobile Rentals: Starting at $200/person. Please call Ranch for quotes on Lodge rental and hunt/fish drop camps. Special pricing is available if you rent the entire facility, which can accommodate 37 in cabins, 12 in the soft tents. Heather Conley. We saw the vacancy sign from the road at about 11pm and decided we needed some rest. We called to check if we can stay there with 2 big dogs. They were very welcoming and the price was great. Our cabin was clean and cozy and we would love to come back again. We were so happy here, we stayed again on our trip back home. The spring water coming through the faucets tastes better than our water at home and the water pressure was good. The old cabins we stayed in were well kept and clean. Cabin 3 and cabin 4. They provided a fan and coffee. Movies for the tv's were available, but we didn't watch tv. We walked through the lodge before we left and it was beautiful. Great place for an event. We have to come back again.